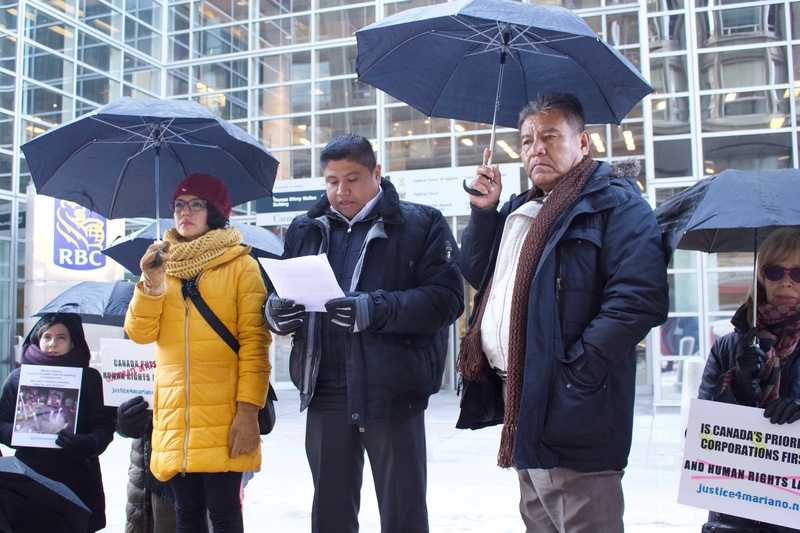 (Ottawa) On Monday, family members of Mariano Abarca – a Mexican community leader who was murdered for speaking out about the negative impacts of Blackfire Exploration’s barite mine in Chicomuselo, Chiapas, almost ten years ago – attended a hearing in the Federal Court of Canada. The Abarca family seeks a full and impartial investigation into the acts and omissions of the Canadian Embassy in Mexico while it lobbied in favour of Blackfire in the lead-up to Abarca’s assassination, which the family believes heightened the danger he faced. Mariano Abarca’s brother and one of his sons were present for the hearing and are signatories to the request for judicial review. Over 20 members of the Ottawa community rallied outside the Court in solidarity with them prior to the hearing. “We have no doubt that Mariano was killed for speaking out about the environmental and social impacts of Blackfire’s mine. 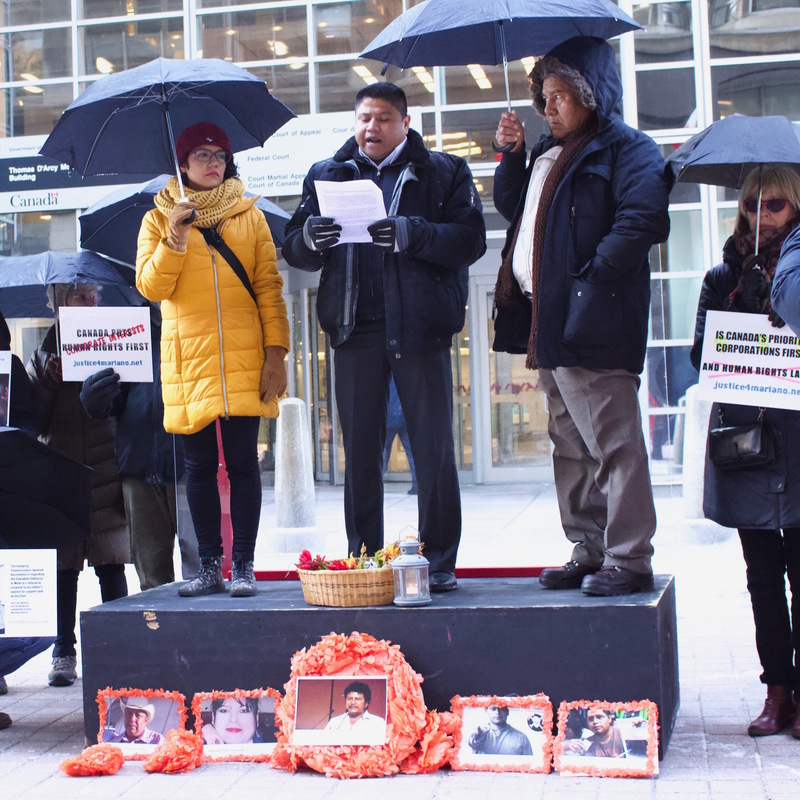 We also believe that the Canadian Embassy in Mexico bears responsibility for pressuring Mexican authorities to back the company and quash community protests, even when they knew that Mariano’s life was at grave risk. Contrary to the weak attempts by the Canadian government’s lawyer to argue that our complaint is speculative, there is abundant evidence and we hope that the court will demand a serious investigation into the case,” remarked Uriel Abarca, Mariano’s brother. The complaint is based on extensive documentation obtained from the Department of Foreign Affairs and International Trade (now Global Affairs Canada) through Access to Information requests that reveal the essential role the Canadian Embassy played in facilitating the operations of Blackfire Exploration in Chiapas from start-up and even after the mine was suspended for environmental violations, days after Mariano Abarca’s murder on November 27, 2009. The family filed for judicial review in May 2018, after the Public Sector Integrity Commissioner (PSIC) refused to investigate their complaint. The PSIC denied the investigation stating that embassy officials could not have erred, since he concluded that government policies regarding corporate social responsibility and the embassy’s role in mining conflicts that were posted online or cited in testimonies to parliament were not “official”. The government’s lawyer defended the Commissioner’s position in court, arguing that these policies are voluntary and non-binding, noting a lack of any binding legal framework to cover this area. “We are astonished that the government of Canada would argue that its embassy officials have no obligation to follow government policy and that the policies it does have are not worth anything, even when lives hang in the balance. We hope that the Federal Court will provide clarity on the legal obligations of Canadian embassies and, in the case that none exist, that a binding framework will urgently be put in place to avoid putting at risk many other mining-affected community members in the region who are confronting similar danger to what Mariano faced,” remarked Libertad Díaz Vera, who attended the hearing on behalf of Otros Mundos-Chiapas, a co-complainant in the case. Illustrating the grave risks that mining affected communities face, the Justice and Corporate Accountability Project (JCAP) documented 44 deaths, over 400 injuries and more than 700 cases of criminalization in mining conflicts involving 28 Canadian mining companies in 13 Latin American countries from 2000 to 2015. In his opening remarks. Federal Court Justice Keith Boswell recognized the gravity and importance of the facts in the case of Mariano Abarca. “It is vital that the judge recognizes the severity of the facts and the Abarca family’s lengthy search for justice for what happened to Mariano. This underscores the public interest of there being an investigation in this case, even more so taking into consideration the proliferation of mining conflicts in Mexico and Latin America, the intense criminalization and violence that affected communities face, and the role of Canadian interests. The Commissioner failed to seriously take the public interest into consideration, but we hope the Court will in its judgement,” stated human rights lawyer Yavar Hameed, who is defending the complainants in the judicial review. Lawyer Shin Imai is also supporting the case and presented arguments during the hearing. Complainants include Abarca family members, Otros Mundos-Chiapas, the Mariano Abarca Environmental Foundation, the Human Rights Centre at the Autonomous University of Chiapas, the Mexican Network of Mining Affected People, and MiningWatch Canada. A decision is anticipated in coming weeks. A summary of this case can be found here; the request for judicial review (memorandum of fact) is here; and the memorandum of fact of the respondent (the government of Canada) here. Ahead of the hearing and the visit to Canada of Abarca family members and Otros Mundos-Chiapas, MiningWatch Canada contacted Minister of Justice and Attorney General of Canada, David Lametti, for a meeting with the delegation. The request was refused. They also attempted to schedule a meeting with the Director of Policy for Global Affairs Canada, Erin Flanagan, who has not responded to numerous emails and phone calls.